These B.C. boys are a tight bunch. 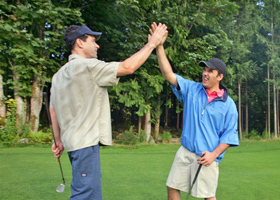 They celebrate their birdies together, mourn their bogeys and motivate each other to play well. They have a lot of fun doing it. Former NHL players Devan Dubnyk, Wade Redden, Chuck Kobasew and Todd Simpson in a charity skins match with four golf pros from the Mackenzie Tour-PGA Tour Canada circuit. The match was part of the opening festivities of the inaugural GolfBC Championship, which begins with Thursday’s first round. Tournament golf is an individual sport, but this week John Mlikotic, Conner Kozak and Chris Trunzer also feel like they are playing on a team. That would be Team GolfBC. Mlikotic, Kozak and Trunzer are all part of the GolfBC family and proud to be representing the title sponsor at this week’s inaugural $175,000 GolfBC Championship at Gallagher’s Canyon Golf & Country Club. The 19-year-old collegiate player from Mercer Island, Wash. prepares to tee it up alongside the boys in this week’s inaugural GolfBC Championship at Gallagher’s Canyon Golf & Country Club. Bendrick insists she is more excited than nervous about playing on the Mackenzie Tour-PGA Tour Canada circuit on a sponsor’s exemption.